This valuable new research report provides a unique data set that offers a first-ever view of medical school faculty’s income from research grants and technology licensing, as well as their perceptions of technology transfer offices. The Survey of Medical School Faculty: Earnings from Research and Technology Licensing and View of Technology Transfer Office covers a wide range of medical specialties, including in-depth commentary and analysis based on extensive survey results from 141 universities from the USA and abroad. You can rely on the accuracy of the detailed data, commentary, and analysis provided in this informative report. It was compiled and written by James Moses, President of Primary Research Group, and Joseph R. Flicek, who established the New Ventures Office at Columbia University and served as Director from 1996 to 2002. 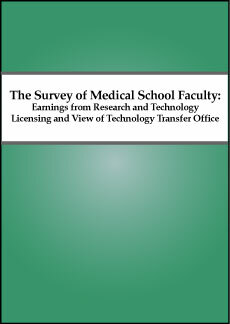 The Survey of Medical School Faculty: Earnings from Research and Technology Licensing and View of Technology Transfer Office is available for the low price of just $195, in print or PDF. You can also make this invaluable resource available to your entire staff with an economically priced site-license purchase – just $295!